Try to understand how little a detail cop does when standing around at a work site. Well, this cop went out of his way to hassle a taxi from Boston. 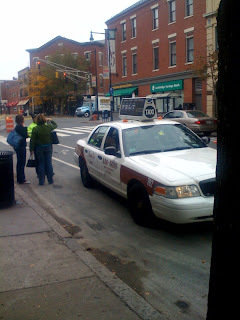 Last Thursday morning, he kicked those two women out of the cab and lectured the taxi driver. All the while, cars were careering through the intersection vacated by the detail cop. For that, I give the Cambridge, MA police a failing mark.